One of the best types of siding to use today is called James Hardie siding. It’s very durable and looks absolutely amazing. However, many home owners who currently have vinyl siding installed on their homes aren’t ready to make the switch to James Hardie siding. When it’s time to replace the siding on your home however, upgrading to James Hardie siding over vinyl siding may be a good idea. When you get a siding contractor in Dearborn Michigan to install James Hardie siding on your home it can add value and make the home more energy efficient. Although vinyl siding can do the same thing there are some distinct differences to both of these types of siding choices in Dearborn Michigan which we’ll cover here. Choosing either vinyl siding or James Hardie siding can be a great choice for your home. both of these types of siding has many advantages over other types of siding. They don’t rot like wooden siding and they are almost impervious to weather. Both vinyl siding as well as James Hardie siding is also insect proof. So you don’t need to worry about insects destroying your home’s siding. The maintenance requirements for both of these types of siding is also very low so once it is installed you don’t need to worry about it much. Both of these types of siding come in a variety of styles and colors. Vinyl siding offers a large variety of colors which you can choose from. Plus, vinyl siding also has different wood grains that you can choose from as well. James Hardie siding also has wood grain siding that you can have installed in your Dearborn Michigan home and the selection is a bit less than vinyl siding. However, the appearance of James Hardie siding resembles wood plank siding much better than vinyl siding. Plus, you can paint James Hardie siding any color you want to. James Hardie siding can also come pre-painted if you prefer. Installing James Hardie siding on your home rather than vinyl siding is considered an upgrade to your home. Installing either type of siding on your home can increase the curb appeal of your home which can also increase the value of your home. One of the best home improvement projects you can do that can increase the curb appeal of your home is to have your siding replaced either with vinyl siding or James Hardie siding. One of the biggest benefits of James Hardie siding in Michigan is that it is very durable. Once the James Hardie siding is installed on your home it gives it a really protective shell outside your home. Since the siding is made from a fiber cement blend it can withstand weather and impacts much better than vinyl siding. Plus, even in the cold Michigan weather the siding holds up well. Vinyl siding tends to get brittle and breaks easier during colder weather. The warranties on these two types of siding are usually pretty close. There are many different brands of vinyl siding however and the warranty on each of these brands can be different or even non-existent. Make sure the siding you choose has some type of warranty included. Most siding material warranties will last about 15 to 25 years. Both of these siding choices can add a bit of energy efficiency to your home. However, to add more energy efficiency when using either of these siding choices means you’ll need to add insulation behind the siding. Be sure to check the insulation factor of the vinyl siding you’re comparing to James Hardie which has an R value of .5 which may not be very good by itself but when coupled with siding insulation it can add some energy efficiency to your home. Want to know more about getting vinyl siding or James Hardie siding installed on your home in Dearborn Michigan? 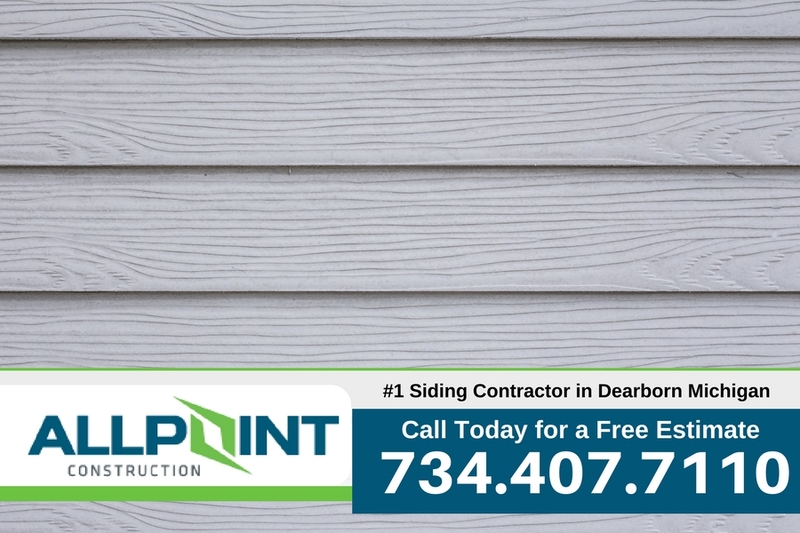 Be sure to call All Point Construction today to get a free estimate on both of these siding choices so you can make a better choice. Call today at 734-407-7110 for more information.